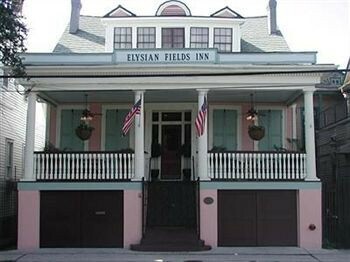 Property Location With a stay at Elysian Fields Inn in New Orleans (Faubourg Marigny), you&apos;ll be minutes from Frenchmen Street Jazz Clubs and close to Mercedes-Benz Superdome. This romantic bed & breakfast is within close proximity of New Orleans Mint and Gallier House.Rooms Make yourself at home in one of the 9 guestrooms featuring DVD players and flat-screen televisions. Complimentary wired and wireless Internet access keeps you connected, and cable programming provides entertainment. Private bathrooms have designer toiletries and hair dryers. Conveniences include phones with free local calls, and housekeeping is provided daily.Dining A complimentary continental breakfast is included.Business, Other Amenities Featured amenities include complimentary high-speed (wired) Internet access and an elevator (lift).